If you've not yet stopped by Ming Studios to take a look at their current exhibit "A Man of Letters"—Ming's retrospective showcase of Master Sign Painter, Noel B. Weber—then you can't really call yourself a self-respecting Boisean and you're not doing your part to ensure that Ming Studios continues to flourish as Boise's cutting edge art space. The good news is you still have some time to redeem yourself. "A Man of Letters" continues through March 28, 2015, and is a must-see experience for anyone interested in the art and history of Boise, Idaho, the aesthetics of civic branding, and the inspirational (if not necessary) partnership of tradition and innovation. Jason Morales, the founder and executive director of Ming Studios, works at Microsoft as a specialist on the US Education team. He founded Ming Studios less than a year ago in May 2014 with the inaugural exhibit "Cornucopia" introducing the work of Berlin artist Uli Westphal to Boise audiences while collaborating at the same time with The Snake River Alliance Seed Packet Project to present original work from local artists. Straightaway, his vision to create a conduit of influence between international and regional artists afforded an opportunity to explore the conflict between the marketing strategies of industrial food production and local efforts to promote sustainable biodiversity. Ming Studios then followed through with a solo installation piece by internationally-known muralist Axel Void, who set his eye on two local girls to pursue his practiced themes of the extraordinary sifted from the seemingly mediocre. Morales and his associate program director Kristen Cooper have supplemented their exhibitions with special one-off events such as a First Thursday program of the short films of Dutch artist Katarina Zdjelar (the first true art films I've seen in Boise), a dance performance by Project Flux, and an acoustic concert by local music acts With Child and Bijoux (formerly, Grandma Kelsey). Ming Studios hopes to bring international artists to Idaho via residencies, thereby introducing fresh influences and opportunities for Boise-based artists. He supercedes regional compulsions, offsets implosion with expansion, to suggest a necessary cross-pollination from out-of-state, if not out-of-country, to strengthen Idaho's artistic presence and to move Boise further towards international profile. His vision is thrillingly urban and global. It's exactly what Boise needs to update its civic brand. When I first entered Ming Studios last May, I was intrigued in its having been incorporated into the corner space of Classic Design Studio who almost single-handedly have branded downtown Boise with signage, gilded glass, mural work, and architectural elements. The face of the city is their's. Although state-of-the-art in production techniques, they represent what is successful and traditional in Boise. In 1989, they moved into their studio space on the corner of South 6th and West Myrtle, which was once occupied by the Ming Detail Shop for nearly 30 years. It was where you would bring your car to have a clear coat applied. Their motto was "Ming, never wax again." They liked the name and its four letters and were aware that—among the Chinese—the Ming Dynasty was one of the brightest dynasties of their history; an era when quality craftsmanship was at its height. So they retained the name because they felt it fit. Boise Art Glass used to be in the front space before they moved to their new location. Without even advertising, four or five other businesses enquired after the space but Noel Weber, Jr.—who had taken over the property management from his dad—decided on a collaboration with Jason Morales and supervised the transition. They decided his vision was more in line with what Classic Design Studio had accomplished and were continuing to do: i.e., creating the face of Boise. Their only requirement was that Jason retain the Ming name. Both Creative Design Studios and Ming Studios are proud of their ongoing unique partnership. I'm grateful to Jason Morales for introducing me to Noel Weber and for facilitating my recent conversation with him. I extend further thanks for his allowing me to incorporate information from the exhibition's flyer and promotional postcard. But most of all I thank Noel Weber himself and his son Noel, Jr. When I arrived to talk to him, Weber's hand was casually poised on a mahlstick, comfortably concentrating, as he painted by brush with his other hand. He explained that the mahlstick steadies his hand while he's painting and keeps it off the surface of what he's working on so that he doesn't smear the paint and ruin his patterns. Some people work hand over hand, he offered, while others work with their pinky. Mentorship is the grace note of Noel Weber's artistic narrative. After having learned from others for so many years, he now finds himself in the position of being a mentor to those rising up through the ranks. It has been one of the most satisfying elements of his career to learn, develop, and now share the processes and techniques of his craft with other artisans. His studios have turned out an amazing crop of talented designers and craftsmen, of which he couldn't be more proud. 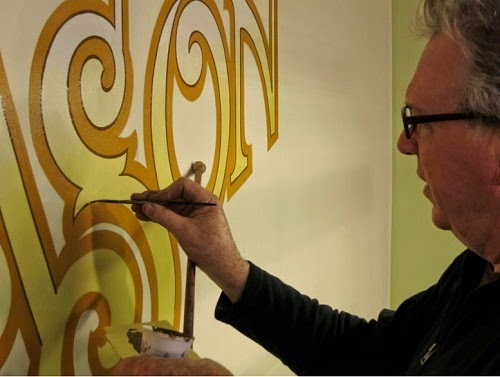 As a kid growing up in Rogers Park during the 1960s, Weber's earliest inspiration and his first opportunity for mentorship came during high school watching Chicago sign painter John Hunt hand letter school buses. He became fascinated and would sit and watch him work every day after school. "The graceful movement of his brush," Weber recalled, "I was just mesmerized." Hunt's kindness and encouragement helped spark his love for letters and design. I asked if he could recall what it was that excited him? What was the nature of his aesthetic arrest? Was he already artistically inclined? Not really, he answered, though he was always doodling and drawing things. He probably did have good art skills, but had no training whatsoever, as nothing was offered by way of art classes where he went to school. But to see somebody put a brush in his hand to deliver a message and actually deliver a beautiful graphic impressed him. Even moreso, he was really impressed with how independent Hunt was. "He'd say, 'Well, I'll be back tomorrow' and then wouldn't show up for two days. It wasn't because he was out goofing off somewhere. It was because he was so busy and he just couldn't get back to that job. When he came back, he'd always do a flawless job." After high school Weber was drafted and served 14 months in Vietnam where he got his first experience as a sign painter sloping serial numbers onto the sides of helicopters and painting company identities. His hand shot up when his platoon commander asked if anybody had any artistic ability (though he's the first to admit his first letters "were pretty hideous"). Notwithstanding, the assignment got him out of being the door gunner on a helicopter. After his tour of duty, Weber returned home and met up with John Hunt to tell him that he had painted some signs in Viet Nam. Hunt asked him, "Well, what are you going to do?" Weber told him he'd decided to take advantage of the G.I. Bill to attend Chicago's Institute of Lettering and Design, where he studied for two years. After, he met up with Hunt again who said, "Let me introduce you to the union business agent." They started him out as a third-year apprentice, crediting him for his two years of school, which was great. He worked in the suburbs for a while before deciding to move to Denver. "Denver in the 1970s was my Paris," Weber recalled. He became one of the founding members of the "Denver 7", the precursors of the Letterheads: a group of young designers disenchanted by their commercial prospects and invested in bringing back the art of their craft. They felt their trade was in decline and committed themselves to becoming the "keepers of the craft." In retrospect, Weber realizes that it wasn't so much that their trade was in decline as it was simply at a lull, but their impatience and disillusionment proved beneficial. "We were finding all these old books with beautiful, spectacular sign work in them and we all knew that was what we wanted to do. We didn't want to just paint real estate signs. We wanted to do beautiful art because at one time signage was an art form. We were looking around for the old guys to learn from, but couldn't find them. So we started teaching ourselves." 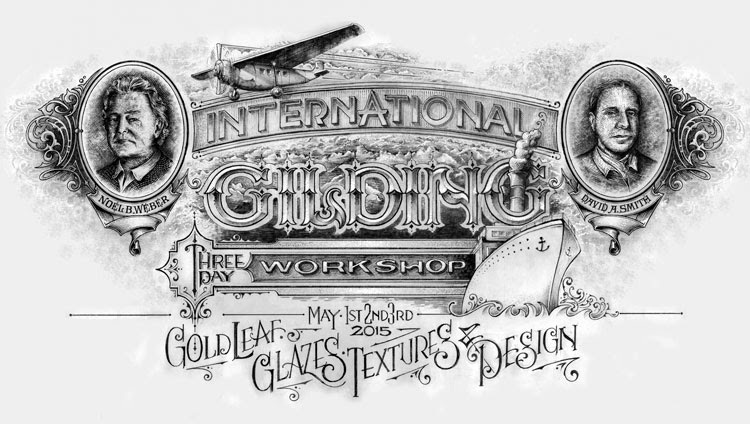 The Letterheads immersed themselves in the study of hand painted signs, gold leaf lettering, and other classic techniques and would share what they discovered at weekly meetings. 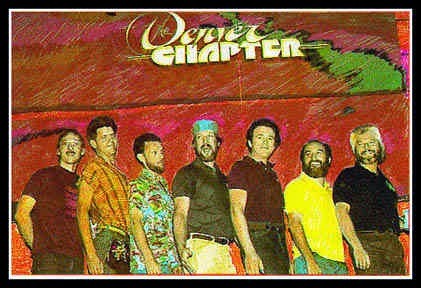 From the original seven—Rick Flores, John Frazier, Bob Mitchell, Mark Oatis, Mike Rielly, Earl Vehill, Mike Author, Joe Tedesco, Jim Schultz and Noel Weber—the Letterheads have since grown into an international organization with more than 40,000 members. Their 40th Letterheads reunion is scheduled for next September at Cincinnati's American Sign Museum. One of the subjects that will be approached at that meeting will be the transition to water-based paints to minimize health and environmental risks. Over the years lead has been slowly removed from the paints they use. "Consequently, they don't work as well," Weber grinned, but assured me they always use caution. The younger set, especially, often use respirators and everyone avoids getting the paint on their skin. Another term that came out of the Denver experience was "walldog", and—as someone who has extensively studied public mural art, particularly by way of its urban Chicano inflection—I was surprised to have never heard the term before. "Walldog is a sign painter's term," Weber explained, "to describe the hard work of painting on a wall. Years ago, a walldog was a guy who would be on a wall for one or two days, using block and tackle, old rope and staging, and it was really physical. It wasn't the most glamorous type of work, but it was fun work. I really like painting walls today but I wouldn't want to do it on a daily basis." In 1979, Weber and his wife Lucy moved to Boise. They didn't really have a long-range plan—they just wanted to make a living—but they were drawn to Boise because the city still had some attractive old buildings and they wanted to design signage to complement them. "We weren't settlers here," Weber explained, "we were pioneers." The business began in their garage / home studio and consisted mostly of hand-painted signs and gilded windows. Nothing was yet automated and most of the work was done by Weber himself with some assistance from his wife and kids. A 1946 Chevy panel truck with its distinctive hand-lettered signage was some of the company's best advertising. Their first big break came in the 1980s creating signage for over 30 small businesses in Boise's newly-remodeled Eighth Street Marketplace. Weber's western flair of lettering—which had not been so popular in Chicago (and might have been partially responsible for why he left the Windy City to look for work elsewhere)—fit Boise perfectly. He explained that a sign must work commercially first of all, but that there's no reason why it can't also be artistic and aesthetic. Their signage is likewise pedestrian-oriented, meant to be appreciated by passers-by who aren't insulted by it or overwhelmed by something flashing or out-of-scale. This ties in to my own love for public art and I appreciate that Weber has melded commercial necessity to pedestrian, public art. Around the same time, Weber began teaching gold-leaf workshops for which he became well-known. When Steve Jobs and Apple Computers released the first home computer in January 1984, it featured a graphic user interface rather than a command-prompt interface, and had a devastating effect on his trade, but only momentarily. Though anyone without any training whatsoever could type letters into a computer and print them out on vinyl quickly and cheaply, it didn't take long to recognize the inferior product. The Letterheads learned to bridge the technology. Classic Design Studios relocated to their current space in 1989 and had more room to develop services. In 1997, they added a CNC (Computer-Numeric-Controlled) router that allowed complex three-dimensional designs to be achieved more quickly and efficiently than hand-carving. But, even then, the detail work was always done by hand. "There's nothing like having a brush in your hand," Weber insists. "I can see the difference, and even hear the difference when that brush hits the surface and I'm pulling a stroke. That feels good." Having been taught to believe that quality craftsmanship can be recognized as the result of the soul of the craftsman whorling out of the fingertips into whatever's being worked upon, Weber's comment resonated with me. He noted as well that all good design begins with the pencil. "That's one of the things we really like here. When we design something, we know we can build it. From the point we start designing, we know it will be something we can make. When I draw a letter, I can paint it, I can produce it. I know that it's going to read and fill a need. When I draw a sign, I try to draw it so that it says a statement and delivers a message without even reading it." That led me to ask about how he designs fonts and their marketability? Weber answered that they have set up their own store to that effect. 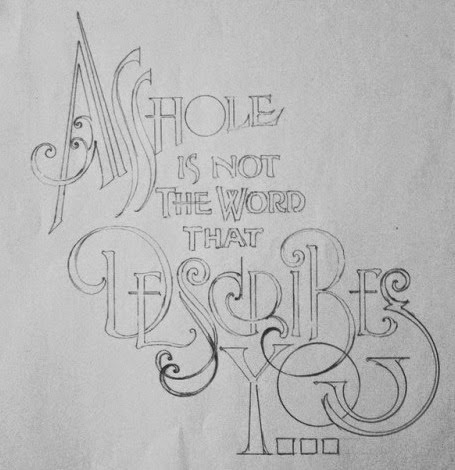 He used to be on the font site Letterhead Fonts but got kicked off by the owner, allegedly for "emotional troubles", so they started Artist Fonts; but, admittedly, the online site has not been going as strongly as he would like, so they're hoping to set up their own store on-site and sell their designs themselves. At least that's what he keeps telling himself as his time becomes more and more preoccupied. They're also doing workshops, which are filling up rapidly. Case in point, their upcoming three-day gilding workshop in May—which he's teaching with ornamental glass artist David Smith (visiting from Torquay, England)—has only a few slots left. He concurs this is a high-end professional workshop, pricier than the average layman can afford. His glue-chip glass workshop coming up in April is already full and will be the first time he's teaching that class. Classic Design Studio has further courses coming up: a design workshop in July, and a porcelain enamel workshop in October. The workshops are instrumental in passing on skills and techniques he's acquired over the years and a great way to consolidate the letterhead community. Although Classic Design Studio has not done any work in San Francisco proper, Andrew Lawrence of Gentleman Scholar Signs came up to study with them. And it was at one of his workshops that he forged a relationship with a craftsman from Disney Imagineering that has resulted in several major Disney contracts for the company from Southern California to Shanghai. "We've done three main projects with them," Weber offered. "We did a project where we were asked to design signage for Adventureland. They wanted it to look like it did when Walt was living in California and just starting Disneyland, so it was all '30s and '40s design and its conception of the future. We designed the signage and they sent it back to us for fabrication. We fabricated some blade signs and 70+ windows. We did all that work here. Last year, we designed a bunch of stuff for their new theme park in Shanghai. I'm also working on a technical alphabet"—Weber gestures to works-in-progress on the walls—"so that they can call out different gilding techniques on glass." I was curious whether Classic Design Studio had set up any classes through BSU but he said no, even though they had reached out to them in the past. They do offer tours to high school students and assistance on student projects. For example, there's a young woman working on a glass project who asked to use their kilns. Otherwise, visiting Ming Studios is a great chance for people to take a look at what the studios are all about. I relayed my excitement when I toured their studios for the first time and found the petrified potato, which I photographed and have been using as my Facebook banner. 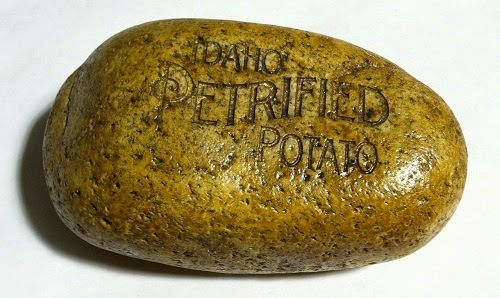 Noel, Jr. relayed that the petrified potato was one of their first ambitious product ideas that they came up with 9-10 years ago. It was an idea they'd had since they were kids, right after pet rocks were the rage. Weber explained he was trying to teach his boys to be entrepreneurs so he encouraged the petrified potato project to help them raise money. He'd take them down to the river where there was an unlimited resource of rocks. He ended up with a 250 gallon drum full of rocks. But at that time they were hand-cutting all the stencil and it was really laborious. To this day, it's a family joke. Another product idea was a limited edition of the sesquicentennial thermometer, which sold well. "Those are ideas you do just because you can." When I asked if he sold any of his original sketches, he said they plan to put a book together. Inspired by seeing them all on the wall in the exhibit. Weber's influence on the national scene underscores his stature as a local treasure. 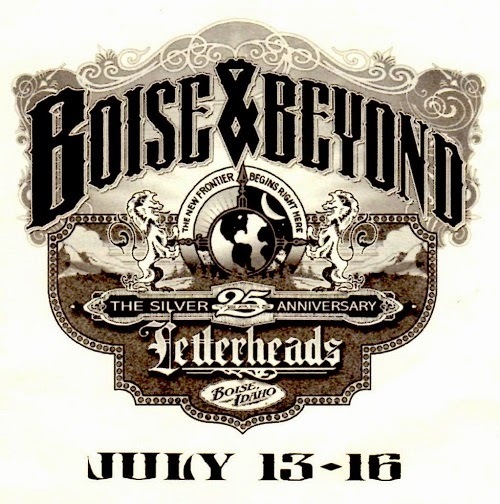 The decade started off with a bang when Classic Design Studio organized "Boise & Beyond", the 25th silver anniversary of the Letterheads, hosting 350 Letterheads who converged on Boise for their annual conference in July 2000. Along with co-organizers Steve and Margaret Marlatt of Advanced Sign & Design, they rented the Centre on the Grove for 26 art and design workshops. 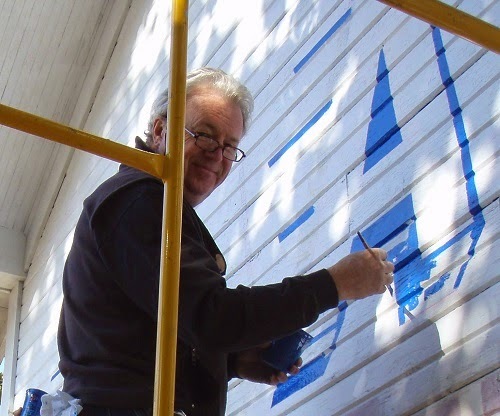 During their visit, Letterhead volunteers painted the impressive murals that still adorn three downtown buildings—the Basque Center, the Adelmann Building, and Hannafin's. The Basque Mural, Weber advised, was painted inside the convention center. Lead muralist, Bill Hueg, designed the mural and the Yankee's Machine Shop donated the panels. Weber, and more than 25 volunteers, worked for three days to complete the project. The mural contains images central to Basque culture. The Stearns motor car mural was painted on-site at the Adelmann in 120º weather. Some controversy exists about whether or not the Letterheads should have painted over the original ghost sign advertising Stearns Motor Car Auto Repair and, unfortunately, the owner of the building has not taken care of it and, consequently, the building's pagoda turret was leaking water for years and it got in behind the paint and has broken it down. One of these days they'll have to re-do it and Weber hopes he'll still be in good enough shape to help. Although urban renewal is often criticized for ruining significant historical architecture—the Stearns Motor Car mural being a case in point—even the Boise Architecture Project has conceded that in some cases urban renewal has helped to make a rather ordinary façade more appealing and unique, adding character to otherwise lifeless walls. Such has certainly been the case with Hannifans Cigar Shop. 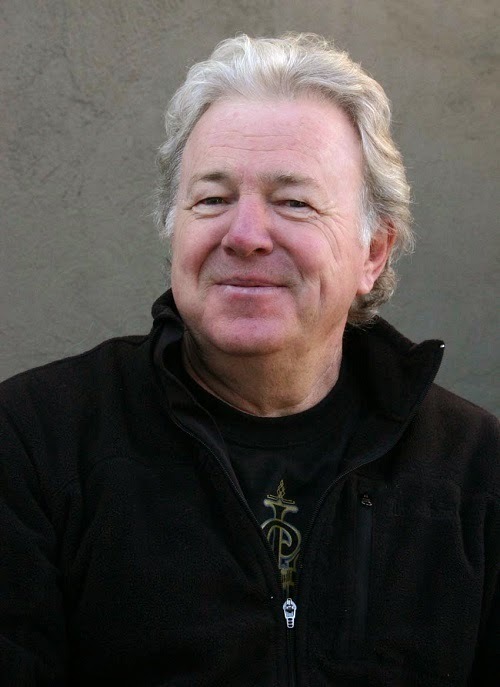 Weber will guide a virtual tour of Downtown Boise at Ming Studios on Friday, March 20, at 6:30PM, sharing photos and the historic context of his work over the last 35 years. Participants will have an opportunity to reflect upon Boise's changing landscape and to inquire about the menagerie of establishments and people who have grown with it. Of related interest: check out Gina Sinisi's 2007 profile "A Finely Tuned Anarchy: Classic Design Studio creates the signs of our times" for the Boise Weekly, which details several downtown projects. Also KTVB's recent television spot in conjunction with the exhibition. To see Weber in action designing the invitation to his upcoming glass gilding workshop, check out the photo spread at Bēhance Gallery's website. I have known this man (Noel B. Weber) and his family for many years. He is one of the most outstanding artists, family man and friend that any one could ever hope to meet. Boise, Idaho should be so proud that he and his family landed there.